I am certain that I have mentioned the fact that Nia changes. Like many things it grows, it morphs, it improves, it changes, yet it remains the same. The basics stay the same. The core of it stays the same, but as time goes on it morphs. Sometimes it is the verbiage and the names of things, but it basically stays the same. It has been a year since I have taken the Nia Blue Belt Intensive. In that intensive we were given a Manual from August 2006 and while we were being trained we were told that a new manual was soon to be released along with some new ways of explaining, talking, and learning things. So part of what I quote here might be a little different from what is being taught now, but the idea and the process is the same. The process is Creating Space. In an intensive, before every session we gather and create the space. This practice was discovered as something done in martial arts. 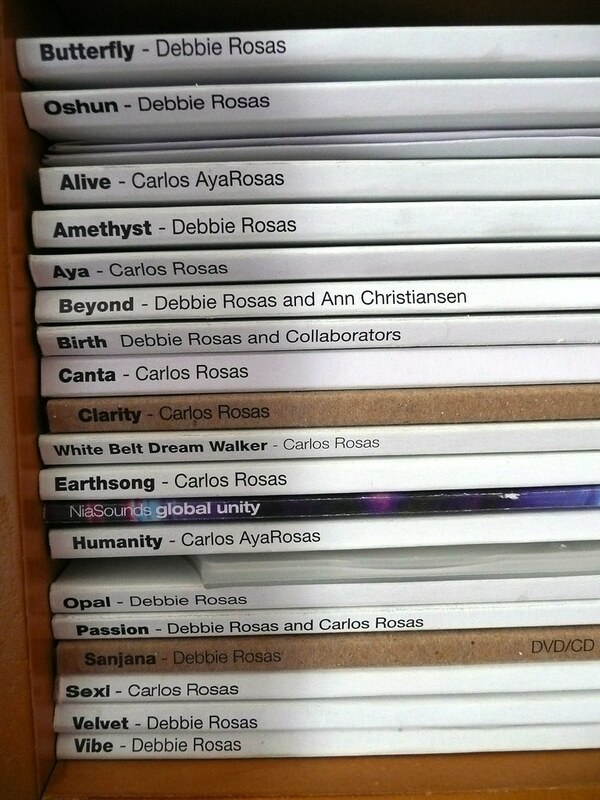 Debbie Rosas and Carlos Rosas, the creators of Nia, recognized its value and brought it into Nia. It is the responsibility of the participants to create the space. It is the responsibility of trainers to hold the space. It is an incredibly powerful act that enables an individual and a group to become prepared for receiving. It is — at its core — coming into stillness. In preparation for creating the space we use a prescribed process. There is a schedule that is kept. A bell is rung seven to ten minutes before we are to start creating the space. This allows for people to wrap up any conversations they might be involved in and to do any last minute things that need to be done. Then there is a five minute bell and another one at one minute. Then, the students create a circle in which we sit quietly while we create the space. The things we do is quiet the mind, stop the inner dialog and just let the mind rest and become open to hearing and receiving the teaching that is about to happen. The body is also stilled. The emotions are balanced and not taking over. We are connected to our higher self . . . the manual says, “open, but you are not seeking at the moment”. A main point is to not allow for distractions of any kind. No physical distractions . . . that is one reason why we sit still. No mental distractions . . .that is one reason why we stop the inner dialog and the thinking. All four bodies, Body-Mind-Emotion-Spirit (BMES), are stilled. The space we create is “a way to set up an energy environment that supports your practice and learning.” It really is a very helpful and powerful tool to help with the learning process. We continue to sit in the space until the trainer interrupts us by thanking us. I believe that many things could benefit from the creation of space; a meeting, family dinner time, Nia classes, a yoga practice, any exercise, and many more. I think it is a good idea sometimes to clear your head and body of distractions in order to concentrate fully on the “task” at hand. I know that for me this practice really works well in the intensives. Is this something that you think you could benefit from? What types of tasks or activities do you think you could create space for? I am not certain “touching” is included in any other workout. I am not certain if it is included in any other cardio dance exercise. Now I am not talking about “putting your hands on your hips as you shake them” or “putting your hands behind your head as you advance forward” or “touch your elbow to your knee” or “putting your hands on your shoulders”. I am not talking about that type of touching. I am talking about touching. Touching for the sake of touching. Touching to gather sensation from your hands. Gathering information from the nerves in your fingers, palms, and the backs of your hands. In Nia we touch. Touching gives us a lot of information. A Nia Routine might have us touching the air around us. We touch to sense the air. We touch the space around us. All around us. Above our heads, behind us, below us. We use our open palms and webbed spaces. We use the backs of our hands. We push and pull the energy. 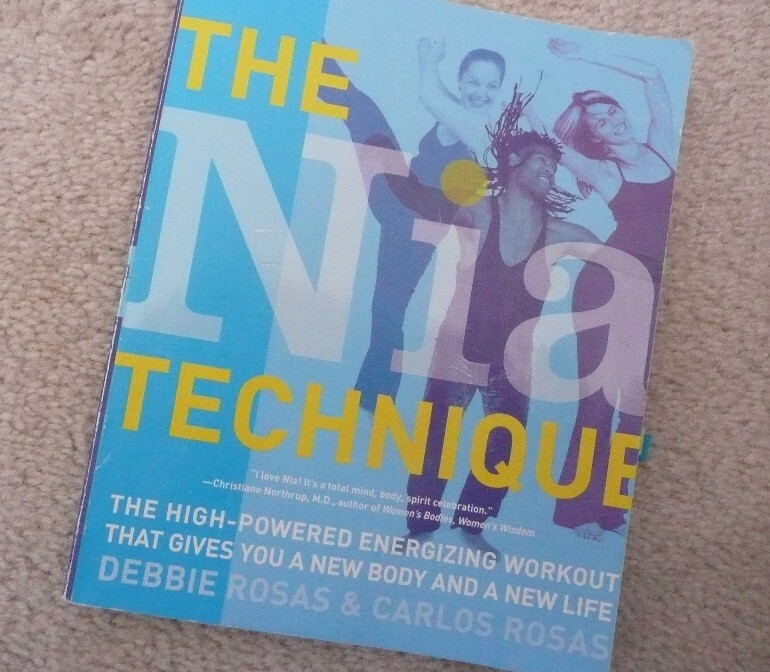 The Nia Technique book, by Debbie Rosas and Carlos Rosas, states “Practicing Touching is excellent training for increasing your Sensory IQ and for improving body awareness.” Touching the space that surrounds the body also moves the energy around — as mentioned the push and the pull. In addition to moving the energy you can draw energy in through the touch or send it out. There is also the touching we do to things. We can touch things while we dance in a Nia class or throughout our day. In a dance class we can touch the floor, the walls, the mirror, the other things in the room. They give us information through touch. We can also touch our skin and our own bodies to gather information. We can touch to create heat. We can touch to supply energy to a specific body part. We can touch to heal. We can touch to allow for sensation or attention. Touching brings awareness. If you are touching your elbow, as an example, with the touch you receive information from two sources. One is your hand that is doing the touching. It senses your elbow. It might feel dry skin, causing you to think you need lotion. The second source is your elbow. Your elbow senses the hand. You might think, your hand is soft/warm/moist. Exchange of information. Awareness. Attention. Touch is amazing. No matter whether we are touching the space around us, the things around us, or our own bodies we can use fingers, palms, and back of hands. With different “touches” we are exchanging different information. Moving and/or releasing and/or gathering energy. Touch is a powerful tool in the Nia toy box. Another way touch can be applied is in the common way of touching as measurement. In the beginning of class, say, before your body is warmed up, you can only touch as far as your shins. Then after was have moved warming the muscles all of the attachments you can easily bend all the way over to touch your toes. Touch. It is a great thing to use for many reasons. In Nia we use touch. Touching is one of Nia’s 52 Moves. What sensations have you received today from things you have touched? Stepping Back Onto The Ball Of Your Foot is certainly not unique to Nia. Many dance modalities incorporate this move. In fact this move is incorporated into every day life. How often are you moving forward only have to stop and move back? You could be in line at the store or anywhere when the person in front of you moves back towards you so you take a step back. While you might not “hang” out on the ball of your foot as we do in Nia you more than likely don’t take a step backwards heel first. So, yes, Nia has taken moves that might be done in other dance practices, martial arts, and even everyday life and put them in their list of Nia’s 52 Moves. Nia then weaves the moves into the Nia Routine choreography. This move Stepping Back Onto The Ball Of Your Foot is part of our Base Moves. It is done with the feet and legs and they are a part of the base. 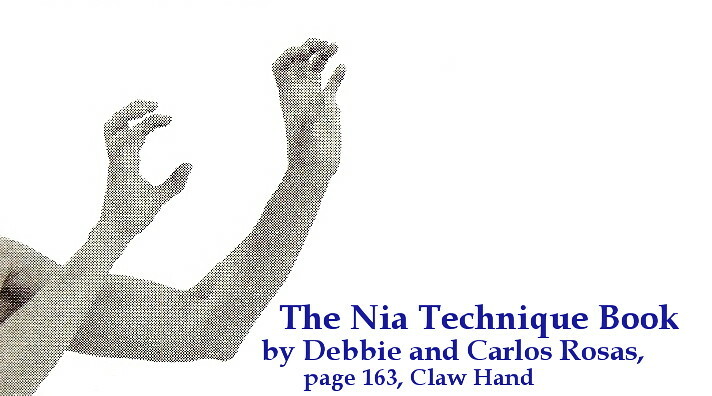 This move is described on page 123 of the Nia Technique book written by Debbie Rosas and Carlos Rosas and you can purchase it from Amazon. As I have said many times there is a proper way to do all moves and while you are practicing them and learning them you do it the proper way. Then as you come across it in a Nia class while doing a Nia routines your body will know the proper way yet be able to adapt to the choreography that you are dancing at the moment. So to practice this move you can start in Open Stance. Then with one leg step back onto the ball of foot. When stepping back pull the leg straight behind not to either side. Keep the foot parallel to the stationary foot, don’t turn the heel. As is indicated step back onto the ball of the foot. Keep the spine up and the heel high off of the earth. Then shift your weight onto the foot of which you just stepped back on and take the other foot off the ground. Your torso is upright, pelvis, chest, shoulders, chin, eyes facing forward. Do the same movement with the other foot. You don’t necessarily always have to start in open stance. After you are comfortable with the stationary start, walk around and stop and step into the move. This move helps with the mobility and flexibility in the foot. It also helps create or improve stability in the ankle. It helps with balance, especially if you hang out for a measured amount of time on the ball of your foot! At the moment I can think of one routine in which we step back onto the ball of foot as a large portion of one of the dances. I know we step back all the time, but in this routine I think of one of the songs as “showcasing” this move. The choreography calls for lifting the leg of the foot that is off the ground. Or doing a knee lift. So that is a good example of the variations that Nia choreography uses with its 52 Moves. Well, what do you think about this move? 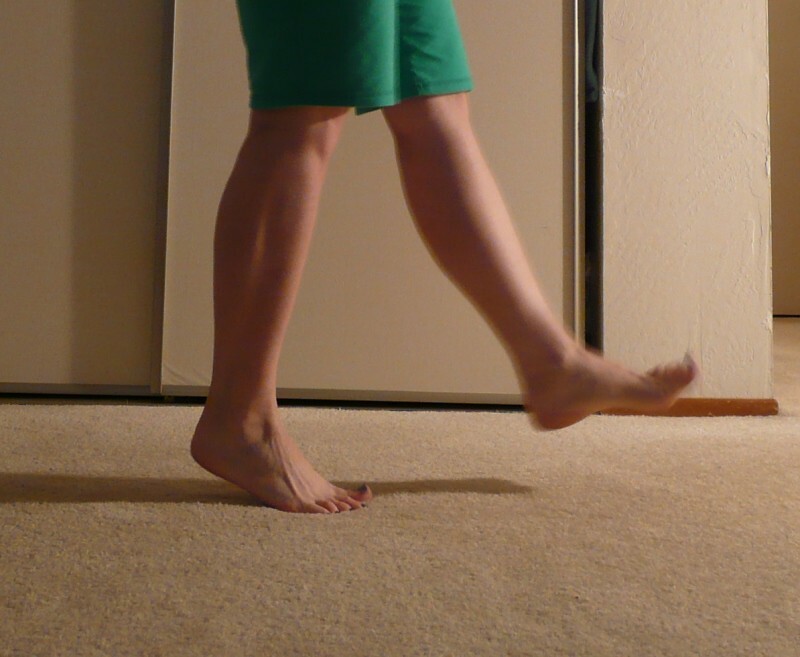 Can you see how it helps with mobility and flexibility in the foot? One of Nia’s 52 Moves is the Sink and Pivot Table Wipe. Ha! Sounds funny. I always think of cleaning when I say this move in class, but not many people LIKE to clean so I don’t like to remind them of cleaning while we are in our Joy! There are many other ways to describe the movement, but “table wipe” really gets the point across. It could be a dramatic sweep of the table. Regardless of what spirit might have me say in the midst of the move there is a particular way to do it. As with all of Nia’s 52 Moves there is a specific way to do it. And . . . as I have said . . . often times the specifics are adjusted to work into the song and the moment’s choreography. To me the Sink and Pivot Table Wipe is a combination of an arm movement and a bow stance. To practice the Sink and Pivot Table Wipe you start in an A Stance. Doing one side at a time, say the left, you would place your left arm out. As you lift up your left foot you turn your body towards the right, your left arm sweeps across the horizon to the right. Your left foot lands gently on the earth on the ball of your foot and your left leg is bent. Your right leg is also bent. The bent legs become the “sink” part of the move. Your arm sweeping is the wiping part of the move. That “table” part is the imaginative part of the move to assist in knowing how the arms sweeps. The arm is straight out and just moves parallel to the ground. Doing the other side, you would you would place your right arm out. As you lift up your right foot you turn your body towards the left, your right arm sweeps out and around to the left. You place your right ball of foot gently on the floor with your right leg bent. Your left leg is also bent. The legs are similar to a bow stance. In most instances — the ones I can think of — in the choreography, I usually do a tiny hop so that my front foot ends up with the toes facing the same direction as the foot in the back, the foot that is “ball of foot”. So as I continue to say, the instructions in The Nia Technique book* show the exact perfect way to do a move. Which is the way to learn it, but then once you know the move the choreography dictates the exact way it is done. The book recommends the word “Whoosh” be said while doing this move. Of course that is just one of many words and sounds that can be made. Sounds are dictated by so many things. The “Whoosh” can be used in the practice of the move, if you would like. When in a Nia class anything goes! I believe this move is a great stability move because as I said I am normally moving both feet in order to sink, pivot, and wipe the table so I need to “land” stable. Also, I think it is great for the legs because any sink type of move helps condition them. It is also good for coordination because you are moving both the upper body and lower body at the same time, but in a little different manner. Tee hee . . . . it is really great for a lot of things, depends on what you put into it. The last couple of times I did it in the current Nia routine I am doing I had the class stretching the arm as far as they could reach as they wiped that table. It was a HUGE table and we wanted to wipe it all in one pass! So what do you imagine you are doing when you do this move? I teach Nia. I actually like to say I lead Nia because to me teaching a dance is more instructive. What I think of as teaching is the type of class where the instructor demonstrates a step or two then the students do the steps a few times, then the instructor demonstrates more steps and the students practice them. Eventually the steps are strung together in a dance. But in my Nia cardio classes it is just lead follow. I do – you follow. I give verbal instructions and/or verbal guides but it is not the type of instructional class where I show you, then you do, then we practice and then we string all the steps together. So I guess it is not an “instructional” or “instructed” dance class. But I do teach by example. You follow my lead. In order to be a Nia teacher I had to take the Nia White Belt Intensive. I have talked about this before, but to review the White Belt is the first level of Nia. The White Belt Intensive is over 50 hours of instruction and is open to anyone. Individuals do not have to have the intent to teach. The Nia White Belt Intensive is about the body so anyone is welcome to join and learn. 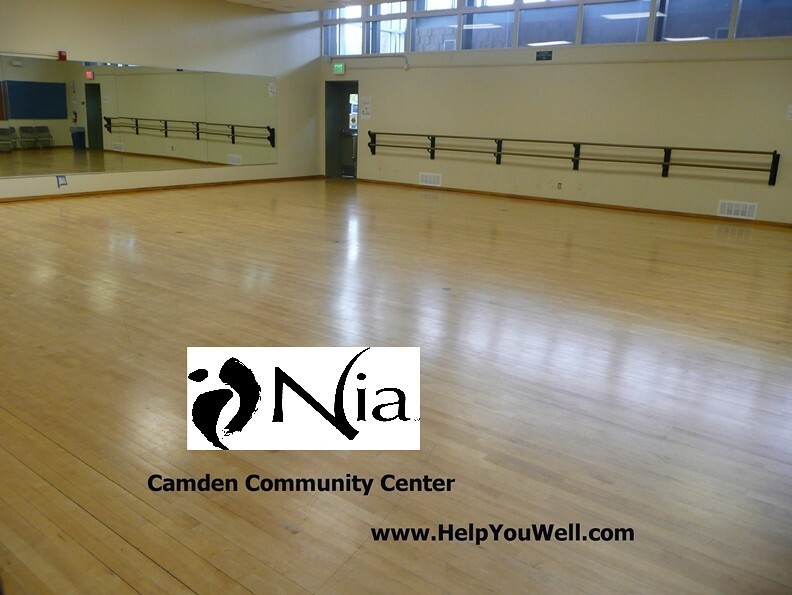 In order to be a Nia teacher there is an additional licensing fee. The fee is due annually and it includes four routines that we, as teachers, agree to learn per year. I was just looking at my DVDs. I have two routines that I have not learned. I have 19 that I have learned. I have been teaching almost four and half years so I am keeping up with the four per year schedule. Now, I want to clarify that I have learned 19 routines. That means that I basically did the bars and have shared 19 routines with my students. That means I roughly know those 19 routines. I could stand up right now and lead you through some of them, but some of them I would have to look at my bars, and some of them I would have to study my bars. But I also feel I am better at just doing. While I want to do the routine as per the choreography, I am not as afraid as I once was to just DO the routine. When I am preparing to do a different routine for my class sometimes I have a chance to practice and sometimes I don’t. I will look at my bars for each song. Sometimes I look at the first few lines and think, “Oh yeah, I know this one.” Then when I am leading it my body and my mind don’t remember it as well as I thought and I just dance through it, but then when I get home I look more closely at my bars or re-watch the DVD. It really is about moving and having fun. As long as we are moving and we are doing it close enough then it is good. Then, like I said, I come home to get the choreography better established in my head and body! The names of the routines that I have on my shelf that I need to learn are Butterfly and Oshun. I just renewed so I have four routines that I need to pick out as my new routines. Picking routines is always a challenge because everyone has such different tastes. Some people LOVE, LOVE, LOVE some of the routines I have and I don’t love them. So for me it is a difficult decision. I try to pick routines that I think my students will like, but then that is just a guess. I know which ones they like out of the ones I teach because they request them often. If you were just picking a routine from the name which one would you pick? As a Nia student which one out of this list is your favorite? What about Nia teachers, which is your favorite out of this list?